Bowers, Brian, Lengthening The Day, (New York: Oxford University Press, 1998). Bright, Arthur A. Jr., The Electric-Lamp Industry: Technological Change and Economic Development from 1800 to 1947, (New York: MacMillan Co., 1949; Arno Press, 1972). Cox, James A., A Century of Light, (New York: Benjamin Co., 1979). McCarthy, Thomas E., The History of GTE: The Evolution Of One Of America's Great Corporations, (Stamford, CT: GTE Corporation, 1990). Stoer, G. W., History of Light and Lighting, (Eindhoven: Philips Lighting B.V., 1986). Transactions of the Illuminating Engineering Society (later Illuminating Engineering). Census of Manufacturers. United States Commerce Department, Census Bureau. Science Service Historical Image Collection, Photographic Series 25, 26, 27, and 66. Electricity Collections, National Museum of American History. Luckiesh, Matthew and Frank K. Moss, The Science of Seeing, (New York: Van Nostrand, 1937). Moon, Perry, The Scientific Basis of Illuminating Engineering, (New York: Dover Publications Inc., 1936, 1961). Journal of the Electrochemical Society. "Different Ways to Make Light" was designed by Thomas M. O'Brien, Interactive Exhibit Developer, National Museum of American History. Materials for the display were provided by OSRAM-SYLVANIA Inc. and Maurice Electric Co. This interactive display consists of five activities that explore the relation between lamps, light, color, and energy. Four different, but common, light sources are compared: tungsten-filament incandescent, fluorescent, mercury-vapor, and low-pressure sodium. A persistent question asks, "Isn't it true that manufacturers know how to make a light bulb that will never burn out, but refuse to make it because it would put them out of business?" As Roberts noted in the quote above, the answer to the first part of the question is yes. However, the reason manufacturers do not make a "forever lamp" has little to do with corporate survival. Energy efficiency (or "efficacy"), color output, and the life-rating of an incandescent lamp are determined by the operating temperature of the filament. At higher temperatures the color improves and the efficacy increases, but the life-rating drops as tungsten evaporates faster from the filament. Professional photographers use special light bulbs for studio portraits that give very good color at high efficacy -- each bulb lasts from 3 to 20 hours. Running a lamp on reduced voltage will lower the filament temperature and extend lamp-life since tungsten evaporates more slowly. But the color of the light will be noticeably red-orange and the efficacy will drop sharply. The money spent on extra electricity to run the bulb would quickly add up to more than the cost of putting in another bulb. (Think of driving a car that never needs a tune-up, but runs only 2 miles on a gallon of gasoline.) Only in situations where changing a bulb is difficult or dangerous do extended-life incandescent lamps make economic sense. The activity "White-Hot Light, Red-Hot Light" demonstrates how energy and color are related in an incandescent lamp. An incandescent lamp is mounted in the display. When the filament is at full power and very hot it emits the full range of rays that we see as white light. By turning a knob, the visitor reduces voltage to the lamp and the filament's temperature drops. As the voltage falls, the filament cools and the blue and green colors fade (as seen on a diffraction grating mounted behind the lamp). Only the red remains directly visible. The lamp still produces invisible heat (infrared energy), however. Seen through a special camera similar to night-vision goggles, the lamp glows brightly in the infrared. Blue and green light require much more energy to make than does red light and infrared heat. As the voltage falls, the higher energy colors fade away. In the activity "Seeing Infrared," the infrared camera also shows how little heat emanates from three discharge lamps. The camera is sensitive to both visible light and infrared energy, allowing one to compare the energy coming from each lamp. All four lamps glow brightly in visible light. But after adjusting the camera, only the incandescent lamp remains bright. However, the other three lamps almost disappear. The mercury-vapor lamp's arc-tube can be seen, as can the electrodes in the fluorescent and low-pressure sodium lamps. Nothing else in these lamps generates enough heat to be detected by the camera. We can feel infrared energy as heat but we cannot see it directly, so for lighting a room it is wasted energy. The activity "Feeling Light" asks one to touch the panel in front of each lamp and compare how warm they feel. The incandescent panel feels warmest, the mercury-vapor panel a bit less so, and the fluorescent and sodium panels feel cool. Much of the energy going into the incandescent lamp is radiated as infrared (heat). The low-pressure sodium lamp emits four times more visible light and uses only half the energy of the incandescent lamp, which is why it feels cooler. The other two lamps also produce more light than heat. We judge the efficiency of a lamp by the amount of visible light it produces from the energy it consumes. 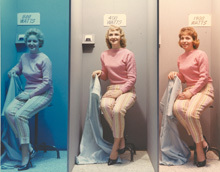 In "Light and Color" one slides a photograph under each of the four lamps in the display to see how its appearance changes when viewed under different light sources. Different lamps emit different combinations of color. The photograph can only reflect the colors produced by each lamp. Low-pressure sodium does not produce blue light, so the sky in the photo appears gray. The 1962 photo to the right demonstrates the same effect. All three models are identically dressed and are in identical surroundings, but they appear different because each is illuminated by a different type of lamp. In this instance, mercury vapor, metal halide, and incandescent (left to right). Because of color characteristics, a lamp may be ideal for one use and not for another. Low-pressure sodium street lamps would not be welcome inside most homes, for example. The final activity, "Making Color," displays the different combinations of colors produced by each of the four lamps. Spectral charts (below) are mounted under each lamp, allowing one to see which color lines appear in more than one. Atoms and molecules in each lamp emit distinctive colors. The graphs indicate that the same atoms and molecules may be present in different lamps. Strong blue lines, for instance, come from the element mercury while sodium produces a strong yellow line. Your eye and brain merge these lines to "see" an overall color. 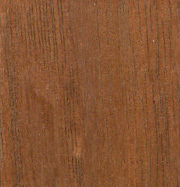 The color a lamp produces depends on the materials used and how those materials are energized. Inventors keep this in mind when choosing materials for their lamps. Howell, John W., and Henry Schroeder, History of the Incandescent Lamp, (The Maqua Co., 1927). Collections of the Mt. Vernon Museum of Incandescent Lighting (Baltimore, Md.). Electricity Collections, National Museum of American History. Tufts University Reference Collection. Electricity Collections, National Museum of American History. Bijker, Wiebe E., Of Bicycles, Bakelites, and Bulbs: Toward a Theory of Sociotechnical Change, (Cambridge, MA: The MIT Press, 1995). Elenbaas, Willem, High-Pressure Mercury Vapor Lamps and Their Applications, (Eindhoven: Philips Technical Library, 1965). Waymouth, John, Electric Discharge Lamps, (Cambridge, MA. : The MIT Press, 1971). Campbell, John H., "The History and Technical Evolution of High Frequency Fluorescent Lighting," (unpublished paper prepared for the Lawrence Berkeley Laboratory, University of California, 1 December 1977). Thayer, Richard N., "The Fluorescent Lamp: Early U.S. Development," (unpublished draft submitted to the Illuminating Engineering Society, 1989). Handbook of the Illuminating Engineering Society, (various editions, 1949-1999).